New York Times/Greenwire published a lengthy fact checking of the documentary "Gasland" last week in anticipation of the Academy Awards. While not as blistering as "Debunking Gasland" by Energy in Depth, it provides an objective look at the claims made by Josh Fox in his documentary. Makes for interesting reading as the piece concludes that many of the claims Fox made in the film are at least somewhat exaggerated. Most interesting that it comes from a publication called "Greenwire" and it appeared just days before the parent paper published a lengthy article critical of shale drilling. Not "Gasland." Josh Fox's documentary did not win the Oscar last night ("Inside Job" did), but the damage through media exposure has been done regardless. Coincidentally, yesterday saw a particularly damaging front page story in the New York Times about the impact of wastewater from drilling on Pennsylvania. The New York Times piece focuses on wastewater from the drilling process, demonizing hydraulic fracturing in a different way than "Gasland," which depended on bad logic and innuendo. Instead, the Times piece focused on contaminants, especially naturally occurring radioactive elements, that are returned to the surface with the frac water and gas. Being an investigative piece, the story has a sensational tone to it, but it also lacks some key evidence to draw its conclusions. Specifically, the story drew conclusions based on pre-treated wastewater. There was no evidence from downstream post-treatment tests, although testing in several Pennsylvania rivers is underway and results will be released next month. The weekly Baker Hughes rig count showed a 14 rig decrease, bringing the total number of working rigs in the U.S. to 1,699. 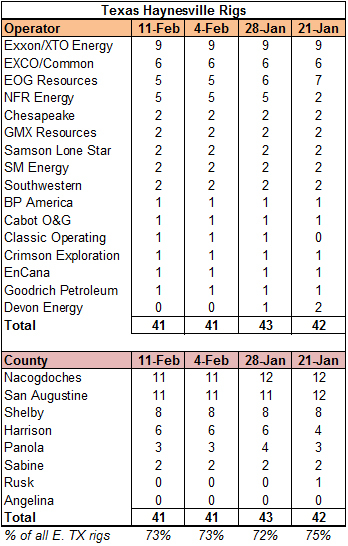 This is the third consecutive weekly decrease and the current level is 40 rigs lower than the recent high water mark. Oil rigs were down 15 to 783, gas rigs were up one to 906 and miscellaneous rigs were unchanged at 10. By type, vertical rigs were down eight, horizontal rigs were down three and directional rigs were also down three. In the Haynesville Shale region, inclusive of other formations, the rig count was unchanged for the thirds straight week in both north Louisiana (115) and east Texas (56). “It’s the only long-term viable option to diesel"
That was not said by T. Boone Pickens, but it very well could have been. Instead, the quote comes from UPS's director of maintenance and engineering, referring to the use of natural gas vehicles over diesel for its trucks. The company has added 48 liquefied natural gas long-haul tractors (not compressed natural gas) to its fleet. Thirty-eight will go to Las Vegas and ten will go to Ontario, CA, where UPS already runs 11 LNG tractors. The 48 new LNG trucks will replace existing diesel trucks, and UPS expects to save 4,000 gallons of diesel fuel per day with the new vehicles. UPS has long been an innovator in strategies to reduce fuel consumption and pollution with a portfolio of alternative fuel vehicles, including LNG, CNG, propane and various strains of electric vehicles. 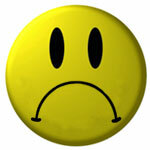 From 1999 to 2009, UPS drivers have logged 77.3 million more miles but have used 3.2 million fewer gallons of fuel. Not bad. 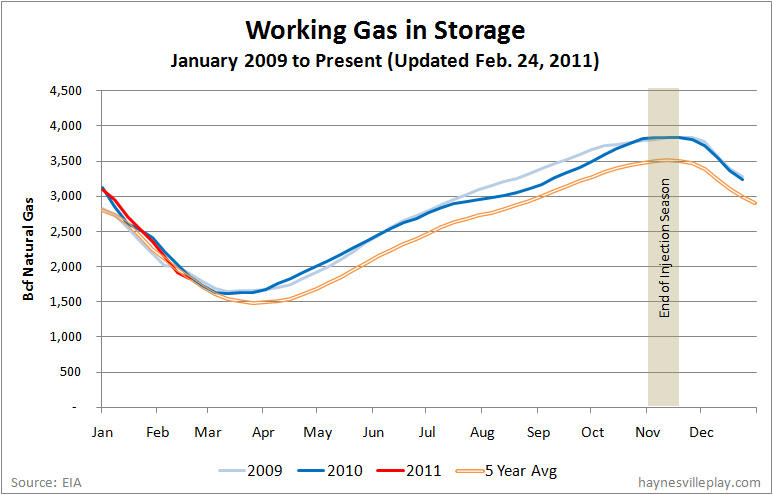 The weekly EIA working gas in storage report showed an 81 Bcf net withdrawal, bringing the inventory level to 1.83 Tcf. The weekly withdrawal was far below last year's (-174 Bcf) and the five year average (-148 Bcf), but the current level is still 2.6% below last year's level (2.052 Tcf) and 3.2% below the five year average (-2.039 Tcf). Temperatures last week in the Lower 48 were warmer than previous averages, with an average of 40.1 degrees. That's 7.4 degrees warmer than last year and 3.6 degrees warmer than the five year average. The weekly Haynesville Shale rig count dropped by one to 148. Louisiana held steady at 108 while Texas dropped one to 40. Goodrich Petroleum reported its fourth quarter results yesterday. 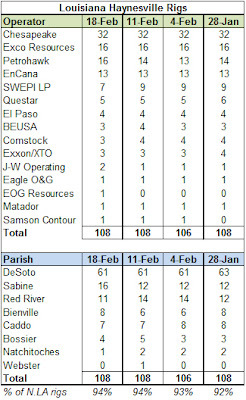 I'll spare you the numbers but to say that the Haynesville Shale accounted for 55% of the company's Q4 production and 51% of its 2010 production. But, in a story that will be repeated frequently, the company's focus is shifting away from the Haynesville this year. In Goodrich's case, it is shifting to the Eagle Ford Shale, where the company will spend 62% of its planned $235 2011 capital budget. Only $52 million, or 22%, is reserved for the Haynesville Shale ($28 million in Louisiana and $24 million in the Angelina River Trend area in Texas). The Bossier Press-Tribune reported yesterday that a second compressed natural gas station will open in Bossier Parish in May 2011. The first station opened in October 2010 and is operating at about a 70% utilization rate, supported mainly by fleet vehicles from Chesapeake Energy, Centerpoint Energy and AT&T as well as the occasional CNG bus passing through town. Balancing the clichés of "if you build it they will come" and the "chicken and egg" dilemma, building new CNG infrastructure is the only way to encourage its use in transportation. Another cliché to consider: "pioneers end up with arrows in their backs." Running a fueling station can be a dicey economic proposition because the margins can be thin (beer and cigarettes actually drive more profit than gas for most retailers). But in the case of these new CNG stations I guess it helps if the owner is also the wholesaler. 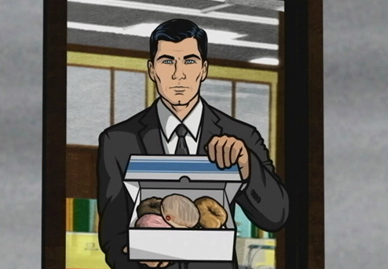 The article contends that the new station should profitable soon. 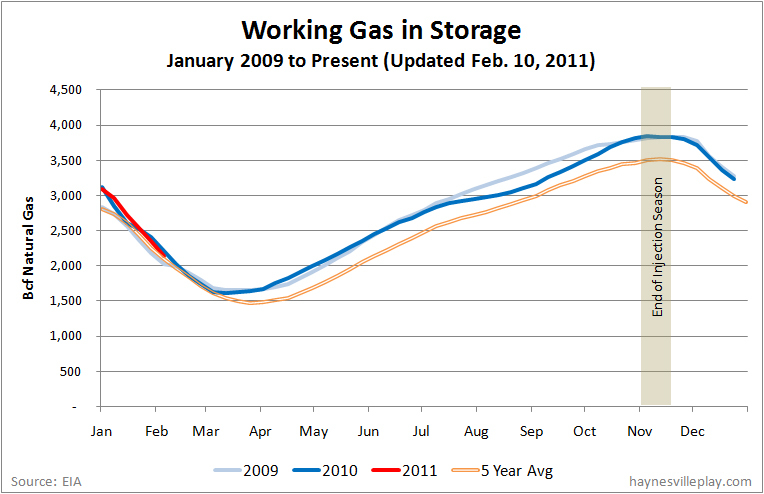 The proof of that assertion will be yet another CNG station popping up. The monthly Mineral Board lease auction was fairly quiet again this month. 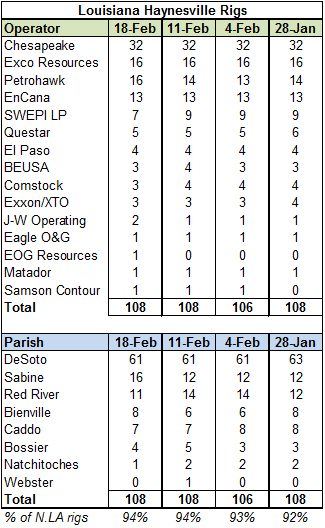 Only three parcels prospective for the Haynesville Shale were successfully leased, all in Sabine Parish. The average lease bonus was $2,819. The weighted average bonus was $2,202, but that was weighted down by a large parcel, not all of which is currently located in a Haynesville unit. Several parcels in central Caddo Parish and another in Sabine received no bids. Saw a short article this morning noting that 2010 Louisiana gas production was 2 Tcf, which was around 36% higher than 2009 levels, which were 12.3% higher than 2008. Not surprisingly, around 61% of the production came from the Haynesville Shale. The 2010 production level is now as high as it was back in 1984. Those who remember what happened in the Louisiana energy industry in the mid and late 1980's hope that's where the similarities end. 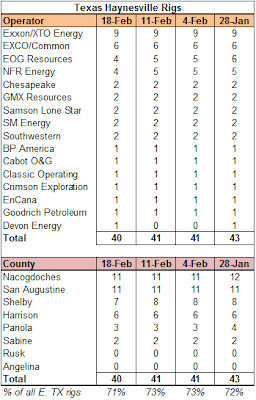 The Haynesville Shale rig count showed very little activity this week (maybe the analysts didn't have time to complete the ArkLaTex area). 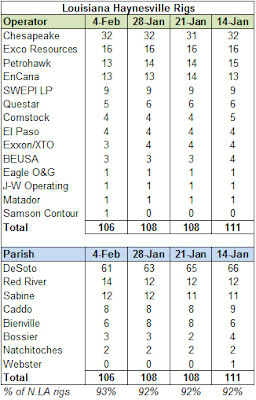 The count increased by two to 149, adding two rigs in Louisiana (108) while remaining unchanged in Texas (41). The spreadsheets and maps have been updated. Chesapeake Energy announced today that it will sell some of its assets with the goal of paying down debt. The company plans to sell its Fayetteville Shale assets along with its 25.8% ownership of Frac-Tech Holdings, LLC and its 20% ownership of Chaparral Energy, Inc. Chesapeake hopes to generate around $5 billion in proceeds (more from Bloomberg). The company's 487,000 net Fayetteville acres currently produce about 415 MMcf/day. Chesapeake signed a joint venture with BP to produce the Fayetteville back in September 2008. In 2009, Chesapeake promoted it as one of its "Big 4" shale plays, but being a more mature dry gas producer with less favorable economics than the company's news ventures, the Fayetteville has become expendable. The weekly Baker Hughes rig count showed a seven rig increase nationwide, bringing the working rig count to 1,739. Oil rigs were up nine to 818 while gas rigs were down two to 911. Miscellaneous rigs held at ten. 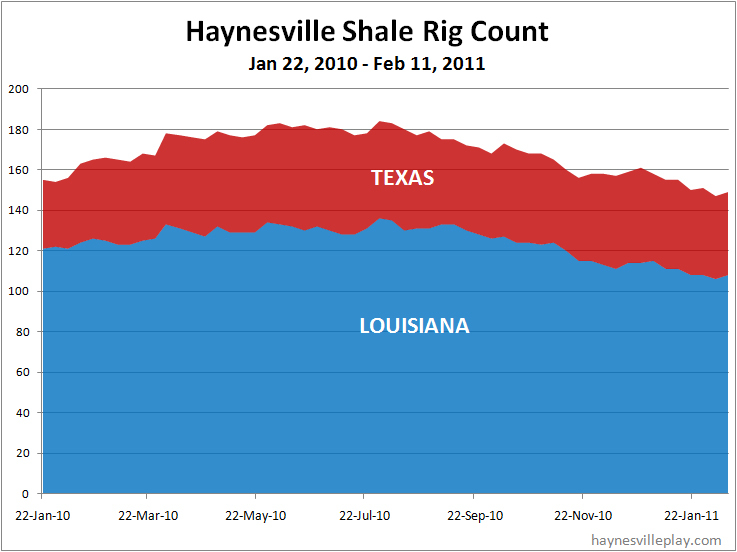 By type, horizontal rigs were up eight, vertical rigs up seven and directional rigs down eight. In the Haynesville Shale region, inclusive of other formations, the rig count dropped by seven to 170. The count was down three in north Louisiana to 114 and down four in east Texas to 56. In its recent investor conference call, Dominion Resources mentioned that the company is considering adding natural gas liquefaction capacity at its existing LNG import hub at Cove Point, Maryland to be able to export LNG. No decisions have been made and the earliest an export facility could be online is 2015, but the location of the Cove Point facility is promising because of its proximity to the Marcellus Shale. 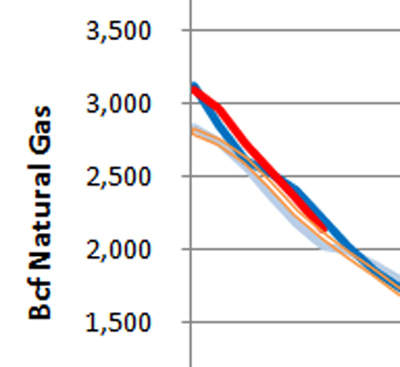 As with other LNG importers, activity at Cove Point has dropped significantly in recent years, down from 220 Bcf in 2005 to 43 Bcf in 2010.